Tiddlywinks: Just Give me a Free Violet Drake! Just Give me a Free Violet Drake! You'd think everyone qq'ing on the forums or on various websites around the interwebs just assume that they should have everything handed to them in a nicely wrapped box. Heavens forbid they actually have to put some effort into something or get lucky for a drop. 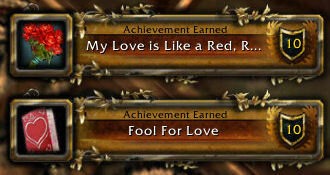 I've held that the holiday achievements for the titles are too easy to obtain, and very few people seem to agree. They think that just because you log in for a holiday they should get the title or put very little work into that title. And when something pops up that the can't complete or something is just too difficult to obtain, go complain on the forums, and generally, the complaint is met with the developers giving in and buckling under the pressure. Various achievements have already been removed from the meta-achievements, and it'll be pretty boring to see everyone flying around on their violet drake come November 1. But, at least we finally did get a holiday that weeded some people out. So that's now four events complete, and all achievements complete from this event (I had Peddlefeet from last year and on my first gift of adoration I received the black dress which I promptly sold on the auction house for 100g. So a successful weekend. Tozz has quickly advanced to 28 and I should easily get him to 30 later tonight.